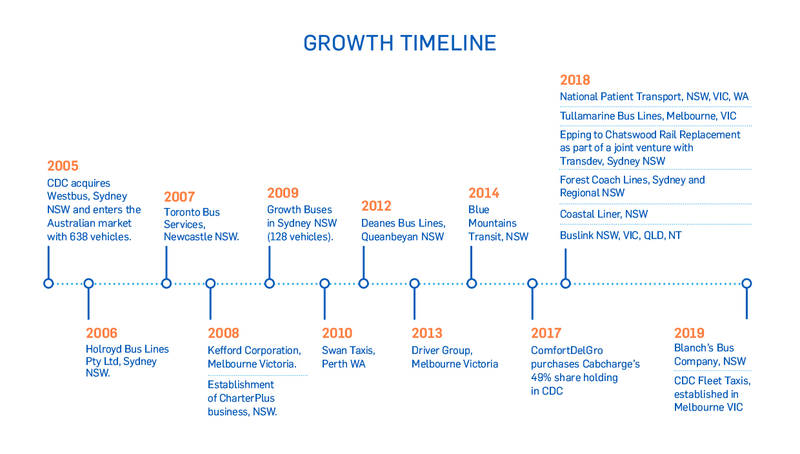 In 2005 ComfortDelGro in joint venture with Cabcharge, acquired the business and assets of the Westbus Group, the largest bus operator in New South Wales (NSW). CDC continued its growth in NSW through the purchase of Holroyd Bus Lines Pty Ltd in July 2006. The following year it acquired the business and assets of Toronto Bus Services in the Newcastle region. Having established itself as a major provider of essential transport services in NSW, CDC expanded into Victoria in February 2009 through the acquisition of the Kefford Corporation’s group of Victorian bus companies. This officially established CDC Victoria which included operating brands such as Westrans, Eastrans, Benders Bus Lines, Davis Group and Driver Group. On 1st May 2018, CDC Victoria also acquired Tullamarine Bus Lines (TBL). We now operate a fleet of over 500 buses and coaches out of six depots within Victoria, providing not just route services, but reliable and competitive charter services for schools, charities, sporting clubs, and various other recreational groups. In 2017, ComfortDelGro purchased Cabcharge’s 49% share holdings in CDC and the company was re-named ComfortDelGro Corporation Australia Pty Ltd.